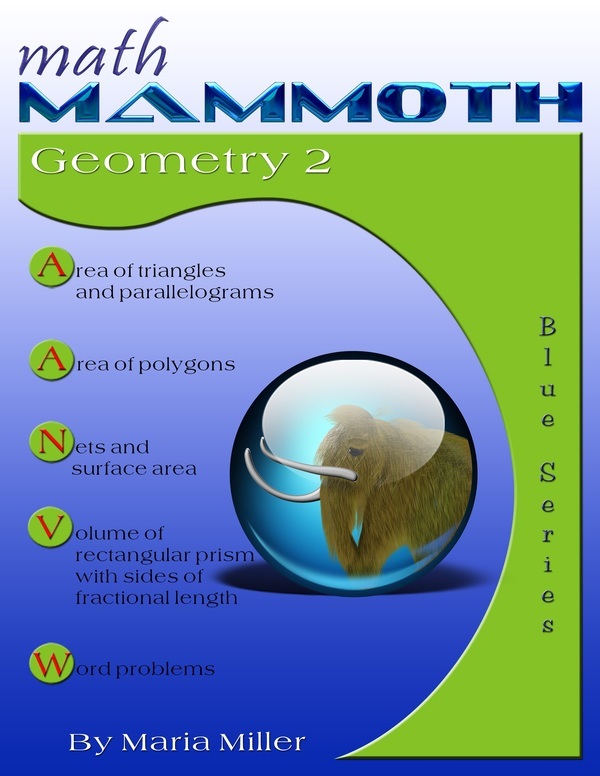 Math Mammoth Geometry 2 - a geometry textbook/workbook for grades 6-7. 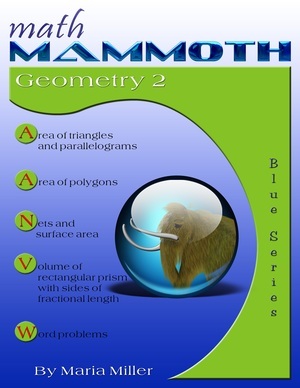 Math Mammoth Geometry 2 continues the study of geometry after Math Mammoth Geometry 1, and is suitable for grades 6-7. It concentrates on two broad and important topics: area and volume of all common shapes. In the first section of the book, which is also the longest, students learn to calculate the area of all common shapes: triangles, parallelograms, other polygons, and circles. They encounter Pi and how it relates to the circumference of a circle. We also briefly study the proof for the formula for the area of a circle. I feel it is important that students encounter justifications for mathematical formulas and procedures and even read some proofs before high school. We don't want students to think that mathematics is only a bag of magic tricks or formulas to memorize that seemingly came out of nowhere. Proofs and logical thinking are foundations to mathematics and school mathematics should not be left without them. Next, we study nets and surface area of common solids. By this point, the student needs to know how to calculate the area of two-dimensional shapes (specifically, the area of rectangles, triangles, and circle). There is one more section about area, in which we learn how to convert between various units of area, both metric and customary. In the lesson Slicing Three-Dimensional Shapes, we slice three-dimensional solids with a plane, and learn that the result is always a two-dimensional shape. Students see that in a concrete way by slicing cubes and pyramids made of modeling clay. Some Internet links (provided in the lesson) will also help students to visualize what happens when a solid is cut with a plane. Lastly, the book teaches about volume of common solids. I assume the students already know how to find the volume of a right rectangular prism (a box). First we expand this topic by calculating volumes of rectangular prisms with fractional edge lengths. Then we go on to calculate volumes of other solids: prisms, cylinders, pyramids, and cones. Besides simple calculation exercises, the lessons contain many real-life applications, word problems, and mathematical problems concerning area and volume. I have tried to create a variety of problems to encourage students' problem-solving skills. These topics (area and volume) involve lots of calculations, and the calculator is allowed in the problems that are marked with a little calculator image. Middle school students also need to learn other geometry topics that are more "geometric" in nature: congruent transformations, angle relationships, and compass-and-ruler constructions (covered in Math Mammoth Geometry 3). Please note that the earlier version of this book (before March 2014 or before Edition 3) covered a different list of geometry topics.